Drew I think we need to write down specifications of what we like to do, getting some general go ahead do what you want will never happen, in github you will find exact specifications and a test program for scanning api, when those who like to develop have agreed on functionality we can ping Shog9 and see what he says. The problem is fragments and objective specifications. I'm moving on and naturally I'm happy with all contribution. Drew I'm not really worried about the database and to tell the truth I hope that it the future it can be avoided (hence SO gives us possibility to filter on cv and flags). For now I wan't to share objectives and software specifications, then we just need to some dev (we need to share what to dev, how it should work). FYI, my 2 cents, I'll take a look at the doc when I have clear thoughts on what I'd like to do. In the mean time, I'm working on a simple chat API for now that @Petter will be able to use to spam send messages with. Great, lets all have fun and if we manage to agree on objectives and functionality then we stitch al together. @Undo The tool we plan on building. @Drew We never said anything about using a flat-file. there was commentary from others concerning "why is a db needed"
I think Sam has a high level something sheet with his Arctic link. Not sure what progress he has made on it. I haven't touched it since we last spoke. Petter's readme is a good start though. Never put any stock in functionality improvements to the API. We need a problem statement. After we've got that sorted, we can work on the secondary goals. And then design the infrastructure needed to solve the root problem. Otherwise we're just wasting time here. I'd like everyone to agree on the root issue we're trying to solve, before continuing. As currently, it seems like several of us have varying ideas of what needs to be done. @Drew We can't fix people's lack of caring. @Drew Then why bother wasting your time to create a tool? So far, Petter's the only one who's provided a valid problem statement. Right. So this is unrelated to your goals then? the powers that be. That think they be. CMs don't wander the chat rooms begging for help. You've gotta take the first step. Does anyone disagree with Petter's PS for this project? @Drew Wrt to user-specific data, I'm not sure. Take Closey as an example. piecharts on user (really low prio), user won't respond to bot (I think they will and if not you could autoscan batch after 30 min to close it), output to url is already in spec. @Drew People had to manually tell Closey that they had started/finished reviewing. I don't think it'll be too much of an issue. Anyway, we could probably automate that command. I don't think they should have to. Sometimes they just want a link to get at later. I am saying dont expect it (an I am done cmd). I, for one, love the idea of sending chat message for possible dupes live. > To build a tool which aids the user in searching/closing duplicates faster, and to provide a more enjoyable reviewing experience (with the intention of attracting more people to join us and help). I've built that on Petter's previous PS. But I think the goals are distinct, hence we could do only one of them. If SO does not approve cherry picking we could still move on dupes. @Tunaki Only reviewing a select collection of questions with certain characteristics. so is filtering by tag in the CV queue cherry picking? Yes, the system allows you to review based on tag. But we're going one step further, by allowing users to filter by CV count (and possibly other metrics later on). and how is cherry picking an issue? Well, as I see it, the point behind the review system is to get eyeballs in front of questions. I really need to run, I would appreciate if you contribute on the git, to get the Objectives file (readme.md) in shape. When we have our goals, objective and general implementation in shape we can ping Shog, to have a eye ball on it.... most of all, we do it all since we like to have some fun..
@PetterFriberg Sure thing, cya soon. I would not remove any reference to Cherry Picking. Rather, I would highlight it. Best to get your answer as soon as possible before effort is made. I'll rewrite the doc for extra clarity. some of "they" be rep-w (as for them they can have it). Answers to dupes don't bother me. I've updated the first section of the readme, thoughts? @Tunaki where in the api is the existence in the cvrq status available? Indeed but that isn't the question here, is it not? Correct me if I'm wrong, but the goal here isn't to clear the CV queue. How is Petter's system relying on info obtained in a non-kosher manner? So it is relying on the fact that a question is in the queue or not? Meaning, only questions that are in the queue are collected by the tool? @Gothdo look, if you want to create a more effective review system, don't build it on the existing review system! Okay. And what info is not available to us in a kosher manner? Ah. I don't see in Petter's doc where that boolean is needed. I am confortable with it. But I still don't see why the information of "the question is in the queue" is needed. Yes Drew it is a secondary queue. So why would we want to tie it to the first one by fetching that boolean? We can't fetch it. We have to synthesize it. But we don't need it, do we? @Tunaki I think that Drew means that we should inform other people that our review system doesn't depend on the review queue. No information available if question is in review or is closed flag --> for simple flags, the current queue with tag filter is actually perfect for hammerers so that's not an issue. Now this new queue wouldn't show flagged questions but is it a concern? Don't think so. @Tunaki No but we need to check comments, hence the "Possibile duplicate "
Yep, but the comments are available with the API. Lets wait with meta for now, this is stuff that is hard to understand for people, for me I'm ready to have some fun testing it out and I'm perfectly ok informing Shog9 that we are testing this. I can hardly believe he will stop our tests, maybe he will block some, he will force us to do something else or maybe he will just help us out. If we manage to do a chatbot that can run in different rooms, maybe we can find rooms as php and r to test it. 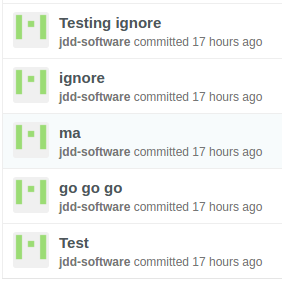 The jar in the github.com/jdd-software/SOCVFinder/tree/master/SOCVDBService is already running try it out. Today was Friday, -1 is the day before, -2 2 days ecc. There is the part of the Gothdo / Shog conversation (the top chunk) that just says "Go Design Your System And Have a Nice Day"
Yeah I'm not really worried about Shog9, I think as long as we use public api and don't touch roomba he will not have problem, the community is more difficult, they don't like that people close stuff (and there is always someone ready to pass a nasty comment) that's why my idea is to let the others room test it, get support slowly.. What is most important is that we have fun building it and clearly if we manage to do something useful for the community is even more fun. They need to see it, test it, understand it, then we can meta it if we like to make it public to all. Perhaps he didn't think Gothdo would design such a system. Perhaps when it becomes popular the tune will change as it threatens cvrq pushing up. But this won't offer trinket badges. In the end I also think that they want people to get involved, have fun on SO, I can not see how this tool can be negative for SO, people get involved, duplicates get closed by the correct eyes ecc. You need to do what you want for this project I think only a small db is need since it will store very few question, since it keep only cv questions and dupes, it will not exceed 20.000 questions. Do you know how many questions are open currently that have a dupe reference. Petter I know the data. I have been doing this for a while. Oh wait, I wrote that. Tell me why you need to screen scrap? quick intervention: why do we need to scrape and why is it a problem if we need to? but in this specific instance, what do we need to scrape? Currently I have all the information need from api to do the project described in doc. If you find yourself making thousands of requests per day outside the API, consider that something has gone wrong. what specific info is missing from the API that we need to scrape something? right Gothdo. I gave Rob a github chunk. But he designed his bot wrong anyway. Petter we are talking about a design doc. I already have all the bot code I want.